We travel across these highways every day broadcasting your message on 3 Mobile Billboard trucks at peak morning and evening hours. The rear advertising panel is 6 x 6 making messages easy to read and nearly impossible not to view. Both side advertising panels are 10 x 6 giving it a three dimensional image that brightly illuminates at night leaving lasting impressions. 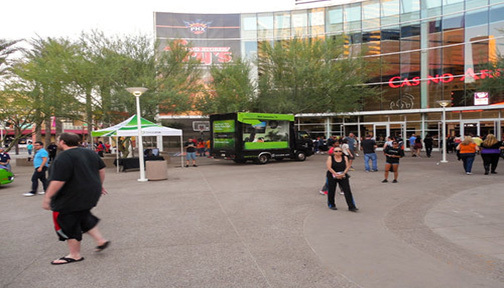 Home of the Phoenix Suns, Arizona Rattlers & Phoenix Mercury. Dozens of Concerts and Major Events. The Phoenix Convention Center is located directly across the street. Two main entrances front and rear. Continuously drive around the facility prior to game time. Frequently driving by downtown restaurants and nightclubs. Parking directly across the street from the facility during the entire event. Impressions are clearly visible to oncoming traffic and light rail. Home of the Arizona Diamondbacks and College Football’s Cactus Bowl. Targeting this venue with constant circles, night life and hi profile parking. Home of the Arizona Cardinals and over 50 big events per year. Driving around the outer perimeter of the stadium 3 to 4 hours prior to game time. Moving Active Adz has secured parking at West Valley Family Church. (Directly across the street from Green parking lot) Every vehicle entering typically with multiple passengers will have a lasting impression from your message. 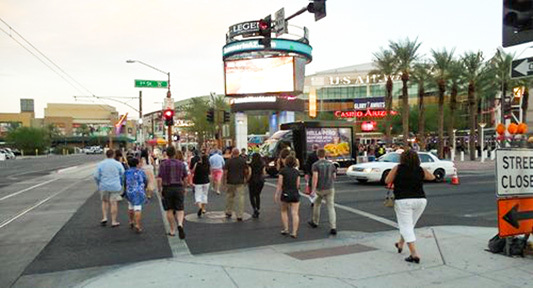 Home of many events such as the Tempe Art Festival, Culinary Festival, Concerts, Block Parties, and Sporting Events. 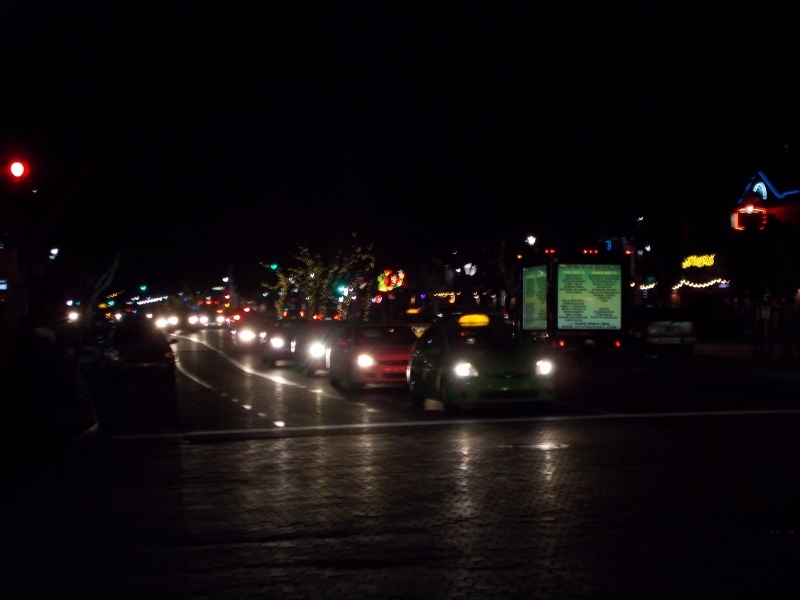 We provide outdoor Billboards in Scottsdale where others can't. 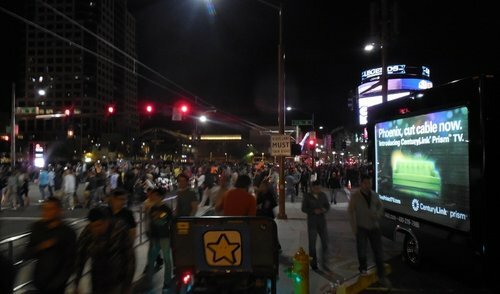 Outdoor dining and night life crowds can easily view your message and engage conversation about your product or company. Moving Active Adz Mobile Billboards cost per thousand views is lower than any other type of advertising including digital billboards and mobile billboard competitors. Moving Active Adz operates 40 hours per week, costing you about $6.50 per hour for all 3 Mobile Billboards all day every day! Costing you about $1.25 to reach 1000 people. There's no hidden costs or contracts, we let our company do the talking. Ads on mobile billboards are free to consumers; you do not have to buy a magazine, cable television, pay a monthly cell phone bill or newspaper to see your advertisement. Mobile Billboards are noticed because of their changing messages, bright bold colors and creative graphics. Moving Active Adz Mobile Billboards allow you to reach more people faster and easier than any other type of advertising. People are driving further and further every day. Repetition is extremely helpful when you are trying to increase your product awareness, or when you simply want to get your message across to millions of people. This task can easily be accomplished with mobile billboard campaigns. Outdoor advertising makes it extremely easy to target, or not to target a specific market. Mobile Advertising using motion has been determined to be the most effective outdoor advertising medium. Directional advertising at any location. Studies measured consumer awareness and sales between static billboards, billboards utilizing scrolling motion and lighting, and no billboards. 43% of the respondents recalled the static billboards over no billboards. However, 94% of the respondents recalled the scrolling lit billboard, but in addition, 80% recalled the specific advertisement. Of even greater importance, static billboards resulted in an increase of sales of 54%, but lit scrolling billboards resulted in an increase of sales of 107%!